This lovely cake was chosen by Lena for our Bake-Along No. 19. Did you know that this is the signature cake of Rose Levy Beranbaum? Rose describes this cake as "buttery and tender and melts in your mouth. I love the little crunch of poppy seeds, but the cake is also fabulous without them." And I couldn't agree more! I have made this cake before, about one and a half years ago (I made a note in Rose's Heavenly Cakes) and I remembered that it was really dense and heavy, did not rise at all, but it tasted good. I have always wanted to try making it again, but well, you know, I sort of forgotten all about it, as I have tons of other recipes to try! So I was glad when this cake was chosen for our bake-along, even though I was rather apprehensive about baking this again! The only change I did was I used my homemade yoghurt instead of sour cream and I reduced the sugar to 180gm instead of the original 250gm. This cake turns out delicious! It is just as Rose describes, buttery, tender with the delightful crunch of the poppy seeds. Even the lemony taste is just the right balance, and I did not even bother measuring the zest, I just used the zest from two large lemons. Can you see the zest of the lemons, a slice of this cake looks very nice with the zest against the speckled poppy seeds! For the glaze, I used the juice from one large lemon and top with about 4-5 tablespoons of sugar, heating till the sugar dissolved and tasting the sweetness to my liking. Do not skip the glaze, I think that the glaze brings out the lemony taste of the cake, and making it moist. After all, it is Rose's signature cake! So tender and deliciously yummy! Let's go over to Lena and Zoe, and see their Lemon Poppy Seed-Sour Cream Cake. Also, pay a visit to our friends that have baked along with us in the linky below. We have included in our Bake-Along, a blog-hop linky, to submit your bake, just click on the linky link "get the Inlinkz code", select and copy the code provided, paste it at the bottom of your drafted post in your HTML code page, save, publish your post as usual, submit your link, and all the links will pop right in your own post! If you are unsure about how to go about it, just send any of us an email and we will gladly assist you. For our next Bake-Along, our theme is "Ciabatta". Ever made Ciabatta before? Ciabatta is an Italian bread with large airholes, this will be a challenge for me, I'm really looking forward to try my hand at making some Ciabatta. Do bake some and join us in our blog-hop, which will be opened on 12/03. Everyone's welcome! See you! SPECIAL EQUIPMENT : One 10-cup Nordic Ware Elegant Heart Pan or metal fluted tube pan, coated with baking spray with flour. PREHEAT THE OVEN : Twenty minutes or more before baking, set an oven rack in the lower third of the oven and preheat the oven to 350F/175C (325F/2160C if using a dark pan). MIX THE LIQUID INGREDIENTS : In a medium bowl, whisk the whole eggs, yolk, 1/4 cup of the sour cream, and the vanilla, just until lightly combined. MAKE THE BATTER : In the bowl of a stand mixer fitted with the flat beater, mix the flour, sugar, baking powder, baking soda, salt, lemon zest, and poppy seeds on low speed for 30 seconds. Add the butter and the remaining sour cream. Mix on low speed until the dry ingredients are moistened. Raise the speed to medium and beat for 1-1/2 minutes. The mixture will lighten in colour and texture. Scrape down the sides of the bowl. Starting on low speed, gradually add the egg mixture in two parts, beating on medium speed for 30 seconds after each addition to incorporate the ingredients and strengthen the structure. Using a silicone spatula or spoon, scrape the batter into the prepared pan and smooth the surface evenly with a small metal spatula. BAKE THE CAKE : Bake for 45 to 55 minutes, or until a wire cake tester inserted between the tube and the side comes out clean and the cake springs back when pressed lightly in the center. The cake should start to shrink from the sides only after removal from the oven. Shortly before the cake is finished baking, make the lemon syrup. MAKE THE LEMON SYRUP : In a 1-cup or larger microwaveable glass measure (or in a small saucepan over medium heat), heat the sugar and lemon juice, stirring often, until the sugar is dissolved. Do not allow it to boil. Cover it tightly to prevent evaporation. APPLY THE SYRUP AND COOL AND UNMOLD THE CAKE : As soon as the cake comes out of the oven, place the pan on a wire rack, poke the cake all over with a thin skewer, and brush it with about one-third of the syrup. Let the cake cool in the pan for 10 minutes. Invert it onto a 10-inch cardboard round or serving plate. Brush the top and sides of the cake with the remaining syrup. Cool completely and wrap airtight. Be warned, these are addictive! I know most lemons bars are! But these have the ingredient, flaked coconuts in the crust, it really is very good! This was bookmarked months ago and never did get round to make it, and finally made this a couple of days ago. If you love lemons and coconuts, then you will love this! The lemon topping has the wonderful tangy taste of the lemons and the sweetness is just right. The bottom crust is wonderful with the chewiness of the flaked coconuts. Put them together and you get a perfect bar. Make sure that the aluminium foil is greased really well at the sides, cause the bars are stuck to the aluminium foil and I've got to carefully separate the foil without doing any damages to the bars. Top with some icing sugar, and enjoy! I bet you won't stop at just one! I definitely did not! Don't worry, it is not very high and you need three pieces to stack up together for the size of a piece of cake! And the top filling does not contain any butter! Oh yes, another piece please! Hahaha, don't mind me, I just need to console myself after my third piece! :) Just one of those guilty pleasures!! Preheat oven to 350F. Line 8x8x2-inch metal baking pan with aluminium foil, leaving overhang on 2 sides of pan. Butter foil. Blend flour, sugar, and salt in processor. 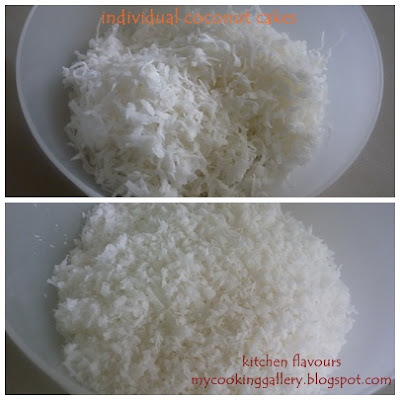 Add coconut and butter, process until mixture resembles fine meal and begins to clump together. Gather dough into ball. Press dough evenly over bottom of prepared pan. Bake crust until golden at edges, about 25 minutes. Meanwhile, combine sugar, eggs, lemon juice, lemon peel, flour, baking powder, and salt in processor. Blend filling until smooth. Remove crust from oven. Pour filling evenly over hot crust. Return to oven and bake until filling begins to brown at edges and is just set and springy to touch in center, about 30 minutes. Transfer pan to rack; cool lemon bars completely. Using foil as aid, transfer lemon bars to work surface. Fold down foil sides. Cut into bars. Sift powdered sugar over. DO AHEAD : Can be made 5 days ahead. Refrigerate lemon bars in single layer in airtight containers. The Artisan Bread Machine by Judith Fertig has been on my wishlist ages ago, I finally ordered the book and have been waiting anxiously for it to arrive since then. I was so excited when I received my book a few days ago and the very next day, made this simple bread. I love making bread, though sometimes reading the long instructions from some books really tires me out, makes my mind works overtime just by reading and understanding the long and tedious (which I'm sure are necessary!) instructions :) So I always look for bread machine cookbooks, though I do have some great books like Amy's Bread and Artisan Bread in 5 Minutes A Day, I have never attempted any recipes from those books, well, not yet! Maybe soon! I was very happy with the contents of this new book, lots of great recipes, and tips. There's even a chapter on how to make your own sourdough from scratch, I'm looking forward to that one. Much as I love my bread machine, I have always prefer to mix the dough in the machine and finish off the baking in the oven. That's what I did with this Oatmeal Honey Bread. This is a lovely loaf of oatmeal bread. The only changes that I did was to omit the milk powder, just because I do not have any in my pantry! The next time when I make this, I'll double up the salt, as I think that it will be much tastier, I'm not saying that it is bland, but I think a little bit more of salt would make it nicer. I only made a 1pound loaf, though the recipes given are for 1lb, 1-1/2 lb and 2lb loaves. It has a nice soft texture. I wrap the bread in plastic wrap and store it in an airtight container, and it was still soft the next day. I enjoyed it spread with some butter and homemade apricot jam and since this is only a small loaf, we finished it all at breakfast. Overall rating : Good loaf of bread! One that I will make again! 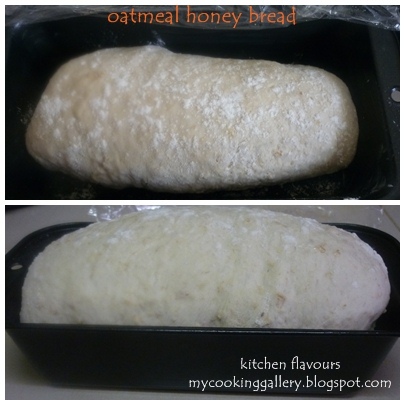 Add milk powder, salt, water, milk, honey and oil to the bread pan. Spoon flour and oats on top of liquid. Add yeast. Select the Basic/White Cycle and Light Crust setting and press Start. Ideally, the water and milk should be between 86F and 95F (30C and 35C), the temperature range in which yeast is most active. Warm them in the microwave or in a saucepan on the stove, and check the temperature with an instant-read thermometer. When making the smallest loaf allowed by your machine, check the dough a few minutes after kneading starts to make sure the ingredients are incorporated. You may need to help the machine along by using a rubber spatula to scrape the corners of the pan. If your dough does not form a ball during the first few minutes of kneading, do one of two things; if the dough looks dry and crumbly, add 1 tbsp (15ml) water at 1-minute intervals until the dough forms a ball; if the dough looks wet, add 1 tbsp (15ml) bread flour at 1-minute intervals until the dough forms a ball. ~ mixed the dough using the bread machine on the Basic Dough cycle. The first rise in the bread machine, at the end of the cycle (1 hour 35 minutes) the machine would have "punch down" the dough and it is ready to be taken out and proceed manually. ~ put the dough on a lightly floured work surface, and rolled out dough to almost the length of the baking pan, about 1" thickness. Roll it up from the longer side like a swissroll, make a nice round at both ends and place the dough in the greased baking pan (for 1 pound loaf, pan size is 8-1/2"x4-1/2"), seam side down. Sprinkle with some flour if desired. Cover with an oiled cling film and left to rise till double in size, about 40 minutes. ~ Remove cling film and bake in a preheated oven at 160C (I use a dark pan) for 35 minutes. Immediately remove bread from pan and cool on a wire rack. ~ note : will double-up the salt next time. These little mini cakes are packed with coconut flavour, from the flaked coconuts. If you love coconuts, then try and make a batch of these. This wonderful recipe is from my latest collection of cookbooks which I just purchased a couple of days ago, "bake!" by Nick Malgieri. It is a beautiful book with a mixture of recipes from cakes, bread, pastries, scones, tea bread, cookies, bars, muffins and lots more. There are twenty chapters in total, with a few recipes in each chapter. Wow, I did not know which one to start with! I made the right choice by selecting these mini cakes to begin with. These mini cakes uses only egg whites and since I have a few dozens of egg whites (yes, a few dozens!) in my freezer that I really wanted to clear, this is perfect! Nick Malgieri states that instead of desiccated coconut, unsweetend flaked coconuts can be used instead, and I love using flaked coconuts in my bakes over the desiccated ones, as the flaked coconuts are more moist and chewier. If using the flaked coconuts, just process it in the food processor to reduce the size of the flakes to about 3mm, be careful not to turn them into powder. I got more than 24 mini cakes, perhaps my mini pans is just a little bit smaller than the ones that Nick Malgieri used to make these. I got a total of 24 mini cakes, about 1 full tablespoons per cake, and have some extra batter left, so I used the standard muffin-sized, which gave me 2 more. I baked the mini ones about 18 minutes and the bigger ones about 23 minutes. Funny thing is the bigger ones rose higher than the mini ones. These are so small and without realizing it, I ate three while taking these photos! And I had two more later with a cup of black coffee. Yes, they are delicious! Moist and very tasty, and I'm glad that I did reduced the amount of sugar, as the sweetness is just right. And even though I used salted butter, I did add on a tiny pinch of salt to the egg whites as the recipe states. The result is a sweet with a hint of saltiness mini cakes, really good with the flaked coconuts. Set a rack in the centre of the oven and preheat to 190C/gas mark 5. In a medium mixing bowl, combine the sugar, flour and unsweetened desiccated coconut; set aside. Spoon the batter into the prepared tins, filling them about two-thirds full. Sprinkle the top of each cake with a pinch of flaked coconut. Serving : Serve these after dessert with coffee, or as part of an assortment of desserts. Storage : Keep the cakes loosely covered with clingfilm on the day they are made. Arrange them in a tin or a plastic container with a tight-fitting lid in one layer and refrigerate them for longer storage. Bring to room temperature before serving. I love spicy food, I would eat it everyday if I could! Now that my kids are older, they are learning to appreciate a little bit of spiciness in their food, which is fine with me! When they were younger, I would always cook a separate non-spicy dish just for them, but now, as long as the dish that I'm cooking is not too spicy, I just need to cook a little bit extra, that's all. Cooking is easier as they gets older, as they love to try out new flavours. According to the book, "500 Curries", this recipe is from the state of Andhra Pradesh, one of the southern states of India, where the hottest chillies, known as guntur after the region where they are produced, are grown in abundance. Well, since I do not have any curry powder or chili powder made from this chili called guntur, I just used whatever I have, which is just as well, as this is not an extremely spicy dish that even my kids love it. Fresh curry leaves from my garden. A bowl of spices all mixed up together. However, I did add on the amount of curry powder and chili powder, as I wanted to have more gravy, although this is a fairly dry dish. This is a really easy dish to cook, except that you have to watch out that it does not dry out, adding some water when necessary from time to time, do not add too much, as this is a fairly dry dish. I would advise to use a non-stick saucepan for this. As I do not like to use too much of coconut milk in my curries, I used only 1/2 cup. During cooking, I added in some water from time to time to prevent the dish from drying out and getting burnt. Really good with white rice. I have some leftover and the kids was asking for it the next day! Heat the oil in a karahi, wok or large pan, and fry the onion, ginger, garlic and curry leaves until the onion is soft. Add the curry paste or powder, chilli, and five-spice powder, turmeric and salt to the pan. Stir well. Add the pork to the pan and stir well over a medium heat to seal and evenly brown the meat pieces. Cover the pan with the lid and cook for about 20-25 minutes. Stir in the coconut milk and simmer; still covered, for about 10 minutes or until the meat is cooked. Toward the end of cooking, uncover the pan to allow the excess liquid to reduce and the sauce to thicken slightly. Garnish with red onion and serve with Indian bread, and with fruit raita, for a cooling effect. The broccoli can be replaced by any other veggie, or a mixture of other veggies like mushrooms, cauliflower, carrots and even Chinese broccoli (kai lan). Broccoli happens to be our favourite, so that's what I use. The meatballs are a simple combination of minced pork, chopped mushroom, chopped spring onions and seasoned with white pepper powder and some salt with a little bit of corn flour and water. Some chopped water chestnut may be added and if you have some prawns or white fish meat, these may be minced and added in too, which would be really delicious. But for today, I only use minced pork as that was what I had. The broccoli and meatballs are steamed separately, retain the juices collected from both during steaming and mix them together later for the gravy. This is one simple, delicious meal that your kids would definitely love! My baking buddy, Zoe from Bake For Happy Kids will be starting a blog hop in March, "Cook Like A Star" featuring Donna Hay as the celebrity chef for the month of March. Please do join in, everyone's welcome. Please drop by Bake For Happy Kids for the full details. Hope to see you in "Cook Like A Star"! Put minced pork in a bowl, add in cornflour, white pepper powder, water and salt. Stir well and keep aside for 15 minutes. Cut broccoli florets to medium large chunks. Steam on high heat for 3-4 minutes. Remove from heat, drain and retain whatever steaming liquid collected from the broccoli, which is not much, but full of nutrients! Stir marinated pork and add in chopped mushroom and chopped spring onions, stir well to evenly combine. Heat up steamer. Steam a teaspoon of meatball paste for about 5 minutes to check on the seasoning, add salt if necessary. Once the seasoning are to your liking, take about 1 tablespoon of meat paste and mould it round, placing it on a steaming plate. Repeat with the rest of the meat paste. Steam on high heat for about 15 minutes until cooked. Remove from heat and place meatballs on serving plate, retaining the steaming liquid collected from the meatballs. Arrange broccoli florets around meatballs on serving plate. Keep aside. Mix the retain liquids in a small saucepan. In a small bowl, mix 1 tablespoon of cornflour with 2 tablespoon water. Heat saucepan and when liquid starts to boil, add in about 2 teaspoon of the cornflour solution (stir the solution before adding in) until gravy is slightly thickened, adding more if you prefer a thicker gravy, add salt to taste if necessary, let it come to a boil and immediately pour over meatballs. Serve hot. HAPPY VALENTINE'S DAY EVERYONE!! To celebrate Valentine's Day, together with Lena and Zoe, we made Red Velvet Cupcakes for our Bake-Along. What did you make for Valentine's Day? Instead of using the usual cream cheese frosting that usually goes with red velvet cakes, for these cupcakes I use a simple icing made up of just icing sugar and lemon juice, really nice actually and pairs wonderfully with these cupcakes. Decorating cakes certainly is not one of my best skills! I did thought of doing a decoration using fondant as I have never done anything with fondant before, but on second thought, best leave the "fondant experiment" when I'm ready for it! I only made half the recipe and instead of getting 12 cupcakes, I only got 8. The only changes I did was, for half a recipe, I used only 1/2 cup of sugar and 3/4 tablespoon of red food colour. And instead of using buttermilk, I use the mixture of homemade yoghurt and some milk, which always works well for me. This Red Velvet Cupcakes is very good! The texture of the cupcakes is really moist, soft and tender! Yum! Let's go over to Lena from Frozen Wings and Zoe from Bake For Happy Kids, to see their beautiful Red Velvet Cupcakes, and also to our friends who are baking along with us in the linky below. We have one exciting news to share regarding our Bake-Along! Starting from our next Bake-Along on 28th Feb, we will be changing our linky to a blog hop. You may copy the blog-hop codes when baking along with us, go to the link provided, which you can find from the hosts' (myself, Lena and Zoe) bake-along post, copy the code and paste it at the bottom of your post in the HTML page of your blog post and submit your link as usual. 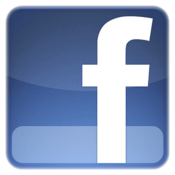 All the links will then be published at the bottom of your very own post! This blog-hop will stay open for 7 days. Please remember to mention this Bake-Along blog-hop event in your own post linking direct to any of the hosts' post and leave a comment. If you have any queries, please email us and we will be glad to assist you! 1. go to the blog-hop link provided. 4. post as usual and submit your post via the link. 6. leave a comment at any of the hosts' post. 7. visit at least one or two other links and leave a comment, everyone loves that! For our next Bake-Along, we will be baking Lemon Poppy Seed-Sour Cream Cake, from Rose's Heavenly Cakes, or you may get the recipe here. We will be posting this bake on 28/02, remember this will be a blog hop! Hope you can join us, everyone's welcome! See you! Heat oven to 350F. Place paper baking cup in each of 24 regular-size muffin cups. In small bowl, mix flour, cocoa and salt, set aside. In large bowl, beat 1/2 cup butter and the granulated sugar with electric mixer on medium speed until mixed. Add eggs; beat 1 to 2 minutes or until light and fluffy. Stir in food colour and vanilla. On low speed, alternately add flour mixture, 1/3 at a time, and buttermilk, 1/2 at a time, beating just until blended. Beat in baking soda and vinegar until well blended. Bake 20 to 22 minutes or until toothpick inserted in center comes out clean. Remove from pans to cooling racks to cool. 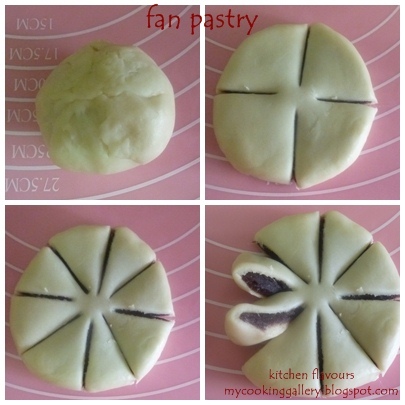 Fan Pastry? 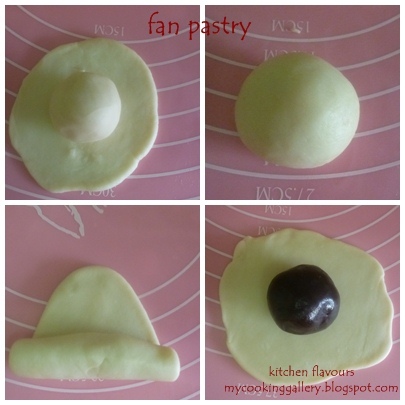 I'm sure most of you must be wondering what is Fan Pastry! 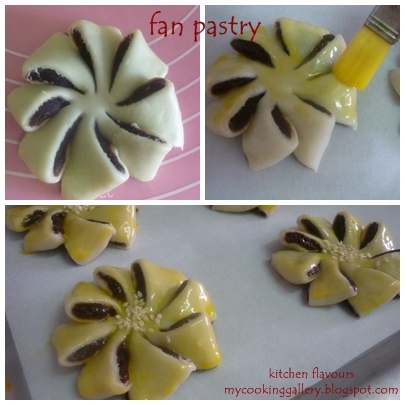 It is a Chinese sweet pastry with the a fan-like pattern, that's all! This fan pastry is perfect as a tea-time snack and for breakfast too. I made this as an afternoon snack. It was one of those days, being a holiday and everyone slept in, we came back late from a dinner party the night before, went to bed at 1.30am, woke up late, had our late breakfast and very early lunch, so called "brunch" and I figured that the family would be hungry when it is tea-time, not that we have tea-time very often! So I made this, since this has been on my mind lately and I have all the ingredients on hand. It was really good and we enjoyed it! I like the pretty petals, does it look like a fan or a flower? Despite its name "Fan Pastry", I think it looks more like a flower! This recipe uses Red Bean Paste as the filling. You may use Lotus Paste Filling or Mung Bean Paste Filling if you like. Either one, I'm sure it will be just as good! 1. The dough on the left is the Water Dough, on the right is Oil Dough. 2. Some red bean filling, scaled at 25gm and mould them into rounds for easy wrapping. 3. The Water Dough are divided into 16 parts, each 15gm, mould each part into a ball. 4. 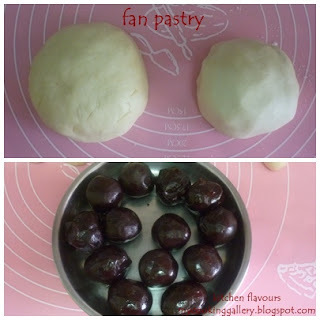 The Oil Dough are divided into 16 parts, each 10gm, mould each part into a ball. 5. Roll out one ball of Water Dough into a round thin sheet, place a ball of Oil Dough into the centre and wrap it up, sealing the edges together. Mould into a round ball. Using a small rolling pin, roll this ball into a thin sheet, and roll it up Swiss Roll style. Repeat this step one more time. Let rest for 10 minutes. 6. Roll out rested dough into a thin round sheet and place one ball of red bean filling in the centre. 7. Wrap the filling, and seal the edges of the dough. Place the sealed edges downwards. 8. Gently roll out filled dough into a round, about 2-1/2" in diameter. Using a small metal spatula or small knife, starting almost towards the centre, cut into 4 sections, still attached. 9. Repeat until there are 8 cut sections, still attached at the centre. 10. Twist the edges of the sections upwards at an angle to form a fan-like pattern. 11. The completed pastry will look like a fan. 12. Transfer to the baking sheet lined with baking paper. (It is easier to transfer the cut pastry to the baking sheet, then twist the sections on the baking sheet). Brush with beaten egg yolk. 13. Sprinkle some sesame seeds in the centre. 14. Bake in a preheated oven at 200C for 20 minutes or until browned and crispy. Transfer to a cooling rack, let it cool a little, about 15 minutes and enjoy. Reaction from my kids : "Looks so yummy and cute!" Layers of tender crispy crust. This is good with a pot of warm Jasmine Tea! Water Dough : Mix all the ingredients to form a smooth dough. Divide it into 16 parts of 15gm each. Oil Dough : Mix all the ingredients to form a smooth paste. Divide it into 16 parts of 10gm each. Filling : Divide the red bean paste into 16 parts of 25gm each. Wrap the oil dough with water dough. Roll out the dough into thin sheet. Then roll it up like Swiss Roll. Repeat this step one more time. Let it rest for 10 minutes. Flatten the above dough and wrap the filling in. Roll out the dough flat using a rolling pin. Along the round edge cut the pastry into 8 equal portions about 2.5cm thick. Twist the edges into petal shapes. Egg wash twice and stick some black sesame seeds at the centre. Bake at 200C for 20-25 minutes. I find that the both the doughs are wet, especially the Oil Dough. I added about 1-2 tablespoons flour to the Water Dough and about 2-3 tablespoons flour to the Oil Dough. As described in the book "Bread Machine Kitchen Handbook", "this French version of an Italian pizza is typical of Nicoise dishes, with anchovies and olives providing the distinctive flavour typical of the region". Ever since I've seen recipes using canned anchovies with the descriptions "stir until the anchovies are melted ", I have been curious about how anchovies can be melted. Anchovies is a common ingredient over here in Asian cooking, but what we have over here are usually the dried ones, which we use to make a base for stock and cooked in various dishes and can be deep-fried till crispy as a snack. But I have never come across anchovies that can be "melted" when cooking. Though this Pissaladiere recipe does not require the anchovies to be "melted", I can now fully understand how that can happen when I purchased a can of anchovies in oil. It is quite costly, more than RM8.00 for one can (product of Spain), and there are only about 8 pieces of anchovies inside! These canned anchovies are salted and soaked in oil and are really soft, easily broken to pieces when I remove them and I can see that these can be easily "melted" if cooked further. They are actually very much similar to our local salted mackerel fish (mui heong ham yee), soaked in oil, which are very tender and can be mashed easily. This pizza is a healthier version with no presence of any cheese! The dough is soft and I have got to let it rest and stretch a couple of times to fill up the pan. The result is a nice, fluffy, soft crust. Instead of using tomato sauce for the base as in most pizza, this uses only a tablespoon or so of Dijon mustard. If you are not a fan of mustard, I guess you can always substitute with your own favourite tomato sauce. The filling are just onions, basil leaves, black olive and anchovies, it is best to break the anchovies to little pieces and scatter all over, as it is quite salty. Review from my kids : Where's the cheese? How come there's no cheese on this pizza???? Oops, sorry kids, I did thought of adding some cheese to it, but decided at the last minute to follow exactly as the recipe..maybe next time!! Overall review : Nice pizza with soft, fluffy crust that would make a great base for any pizza. I enjoyed it with a cup of warm Earl Grey tea. My baking buddy, Zoe from Bake For Happy Kids will be starting a new blog hop "Cook Like A Star". Each month a celebrity chef will be chosen, and everyone is invited to cook from any of that chosen chef's recipes! "Cook Like A Star" will launch in March and Zoe has chosen Donna Hay as the celebrity chef of the month. Please hop over to Zoe for more details. I hope everyone will join in this exciting blog hop, see you there! Pour the water and egg into the machine pan. If the instructions for your machine specify that the yeast is to be added first, reverse the order in which you add the liquid and the dry ingredients. Sprinkle over the white bread flour, ensuring that it completely covers the water and the egg. Add the salt in one corner of the pan and the butter in another corner. Make a small indent in the centre of the flour (but not down as far as the liquid) and add the easy bake dried yeast. Set the bread machine to the dough setting; use basic or pizza dough setting (if available). Press Start.Then lightly oil a 27 x 20cm/11 x 8 in Swiss (jelly) roll tin (pan) that is about 1cm/1/2 in deep. Make the filling. Heat the olive oil in a large frying pan and cook the onions over a low heat for about 20 minutes, until very soft. Set aside to cool. When the dough cycle has finished, remove the dough from the machine and place it on a lightly floured surface. Knock it back (punch it down) gently, then roll it out to a rectangle measuring about 30x23cm/12x9in. Place in the prepared tin, and press outwards and upwards, so that the dough covers the base and sides. Spread the mustard over the dough. Arrange the tomato slices on top. Season the onions with salt, pepper and basil and spread the mixture over the tomatoes. 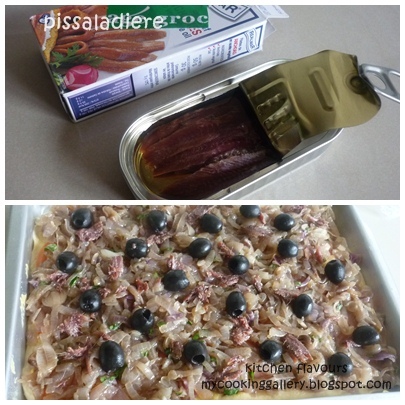 Arrange the anchovies in a lattice and dot with the olives. Cover with oiled clear film (plastic wrap) and leave to rise for 10-15 minutes. Meanwhile, preheat the oven to 200C/400F/Gas 6. Bake the pissaladiere for 25-30 minutes, or until the base is cooked and golden around the edges. Serve hot or warm. There is no recipe posting today. This post is all about "THANK YOU" for the following awards and gifts that I have received from my blogger friends! And also a big "THANK YOU" to everyone (YOU!!). It is great knowing all of you through blogosphere and I really appreciate your valuable time, precious comments and constant visits! During the month of October, Louise has organized a Cookbook Party and I was glad to participate in the party. Did you know that October is a month full of delicious celebration? Well, to add icing to the deliciousness, Louise has some prizes in store! 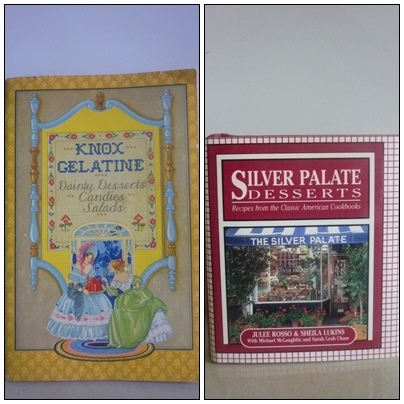 I was one of the winners and received these wonderful cookbooks from Louise! Thank you, Louise! Do stop by and visit Louise over at her blog Months of Edible Celebrations, you will find lots of interesting information on "months of celebrations". EVERYONE knows that February is all about Valentine, but did you know that February is also the month for "Potato Lover's Month, Chocolate Month", and lots more! Do check this out over at Louise's! "Taste of Cayman" series comes with prizes for some lucky winners, and I was one of them! I won this wonderful Caribbean Rum Cake, which I received just a couple of days ago. IT WAS DELICIOUS! 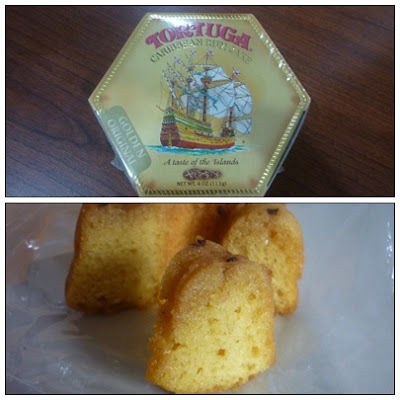 The best rum cake I have ever eaten! The cake is soft, buttery and moist with the wonderful aroma and delicious taste of the rum, distinctly over the top of the cake!! My mission now, is to find out whether this cake is sold locally over here in Malaysia. Hehe!! Rebecka has organized a Fish and Chips Challenge. 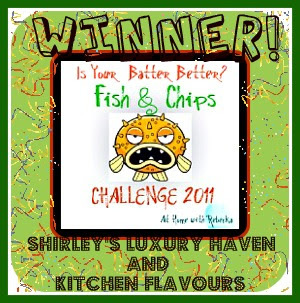 And Rebecka has been wonderfully sweet to forward the Winner Award both to me and Shirley's Luxury Haven. Rebecka is one multi-talented lady, she's an opera singer and has performed in many professional productions. And Rebecka is very creative in creating new delicious dishes, she has some videos showcasing her creations. Rebecka was chosen as the first dessert winner in the Real Women of Philadelphia Cookbook Competition! Her winning entry will be featured in the next edition of Real Women of Philadelphia Cookbook! How cool! This lovely award has been forwarded to me by two lovely ladies, Jen from What's Baking and Chris from Yummy Bakes. 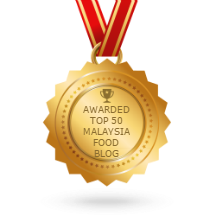 Be sure to stop by these lovely ladies blogs to see their delicious bakes and mouth-watering dishes!! Thank you, Jen and Chris !! This lovely award has been forwarded to me by Jasline from Food Is My Life and Kajal from Purple Chronicle. I am honored that both Jasline and Kajal has forwarded this award to me. Both ladies have beautiful sites with lovely recipes and musings, be sure to stop by and say hello. Thank you, Jasline and Kajal !! In accepting both these awards, I'm forwarding both the Liebster Blog Award and The Versatile Blogger Award to the following wonderful blogs, each is unique in their own special way. Please do accept these two awards and forward them to 10 other blogger friends of your choice.